The wifi Smart Power Strip works with Alexa and Google Assistant to manage your devices through Voice Control. Assign a name to each smart outlet and communicate with each plug by name when sending a voice command. You can also create a group for all your smart devices and control them all with one command. Will help you build an Alexa or Google smart home. With circuit breaker, when detected leak, overload, over-voltage, over-current, or short-circuiting, will automatically break and cut off the circuit. Push-to-Reset. We adopt 18AWG power cord, has certificated by UL with serial number E189672. Length 6.0ft. This Wifi Smart Power Strip built with 3 USB ports, adopts charging fast Smart Technology which knows the maximum charge current of your devices. And each port supplies the maximum charging efficiency allowed by your device, will save more time for full charge. 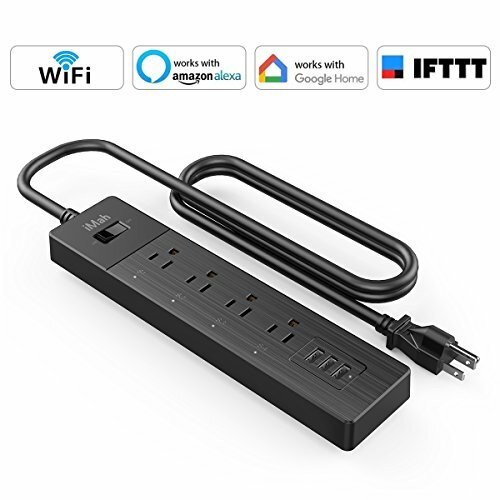 This Wifi Smart Power Strip has 4 outlets, each outlet can work independently, works with Alexa, Google Assistant, control this wifi smart outlets with your voice, will help you build a smart home. ✔ Voice Control ☞ This Wifi Smart Power Strip works with Alexa, Google Assistant, IFTTT. With 4 smart outlets, you can control each outlet individually through select Alexa devices or Google Assistant. Use voice commands to power your devices without lifting a finger. It was great for home electrical devices and Christmas lights. ✔ Remote Control ☞ Use this Wifi Smart Power Strip, you can operate your devices on your phone. Simply plug in a device, connect to your wifi network, and download the Smart Life App make connected. Then you will remote control home devices anywhere even you’re in Paris. Note: It only supports 2.4GHz Wi-Fi network, not support 5.0GHz Wi-Fi. ✔ Safety Protection ☞ Adopt fireproof material and 6ft UL listed cord(E189672) assure its safety. Overload and surge protection prevent your appliances and electronics from spikes or voltage fluctuations. Push-to-Reset CIRCUIT BREAKER. Material: ABS+PC (94V-0 Flame Retardant, a fireproof material which can resist 750 degrees centigrade high temperature) + copper wire (10 AWG). ✔ Timing Control and Energy Saving ☞ Use this Wifi Smart Power Strip, you can set no worry time schedules for your lights and appliances from the smart life App in your phone. Via the free app, you can schedule a lamp to turn on at sunset, or set the TV turn off when it’s time for your children go to bed. ✔ Buy with Confidence ☞ We guarantee 24-hour email support, 30-day money back, 2-year warranty and lifetime customer service to help you build an Alexa or Google smart home.